What an awesome man and wonderful example to everyone. He will be greatly missed. I had the oppourtunity to meet President Hinckley in the garden outside of the Joseph Smith Memorial building in 8th grade. When I shook his hand I could feel the spirit and I have been in awe since then of the wonderful things he has accomplished. You could tell since his wife died that he never got over it and it wore on him. We watched every conference as he joked that he may not be here for the next conference, but I never really thought that the day would come. Can you imagine the reunion in heaven and President and Sister Hinckley?? We have been so blessed to hear from him for 12 years. 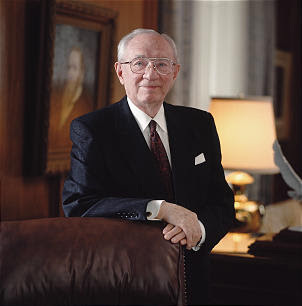 We love you President Hinckley and will miss you.